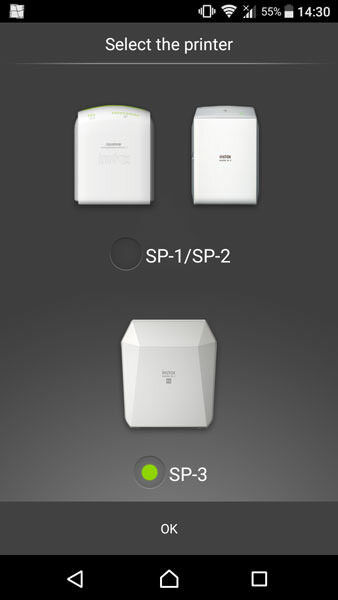 The Fujifilm Instax Share SP-3 is the third generation of Fujifilm's Instax printers, which connect wirelessly to your smart devices enabling you to print your phone images as instant photos. 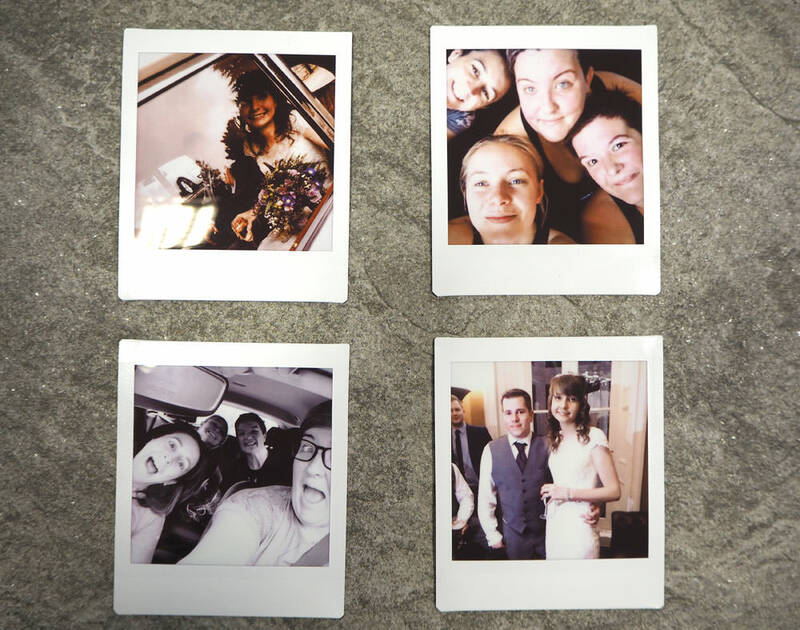 This is the first Instax printer to use square format Instax film as opposed to standard, giving you 62x62mm images. It's available in black with rose gold detailing or white with silver detailing. here, we find out how it performs. As with the older models, the Instax Share SP-3 is mainly made from plastic and has a geometric, angular design. 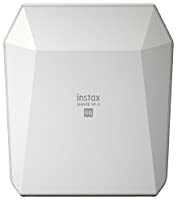 To use it, you download the Instax Share app, available on Android and iOS, enabling you to select photos, add filters and print them at will via Wi-Fi. Fujifilm has recently announced the ability to print to Instax Share printers directly from selected Fujifilm camera models. Currently, these are the Fujifilm X-E3, X-T2, X-T20, X-Pro2, GFX 50S, X-T1, X100F, and XP120. A firmware update may be required to enable the feature. Films take 13 seconds to print and the printer uses a new laser exposure system. 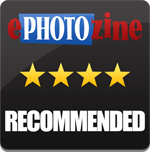 Photos are printed at 800x800 pixel dots and 318dpi, giving a highly detailed print. The printer is very simple to use and operate. The front features the slot through which images emerge as well as a charging icon which flashes when charging and 10 dots, which tell you how many films you have remaining. The dots that light up represent the number of films. On the left-hand side is a reprint button, to immediately reprint the image last sent to the printer. On the right is the on/ off button. Below this is the charging port. 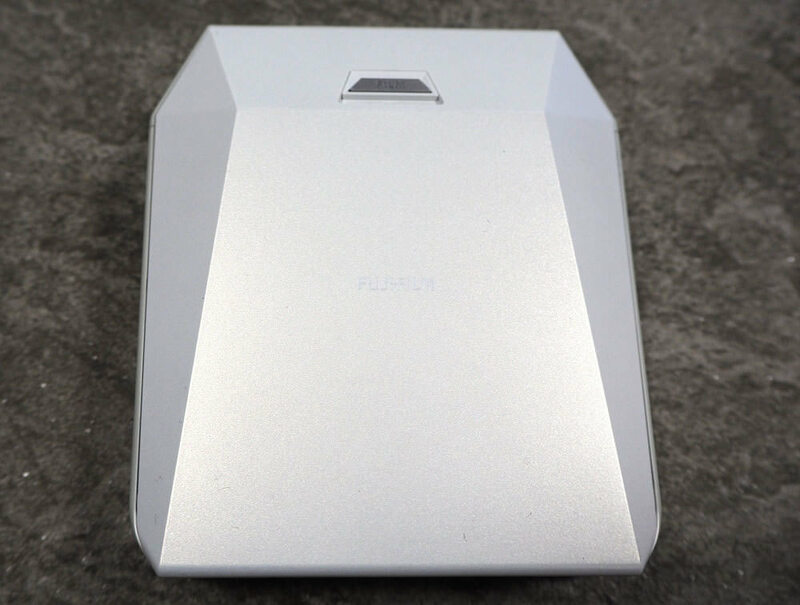 On the back, you'll find a hatch which allows you to replace the battery. Flip the printer upside down and you'll find a catch which allows you to load the film cartridges. Included in the box is the printer, charging cable, battery and a ferrite core which attaches to the cable, to stop radio and TV signal interference. 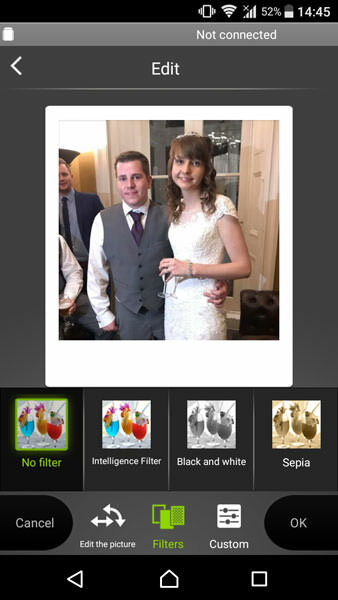 The same app is used no matter which Instax printer you have - you simply select the model you have once you've downloaded and opened the app in the Play store or app store. 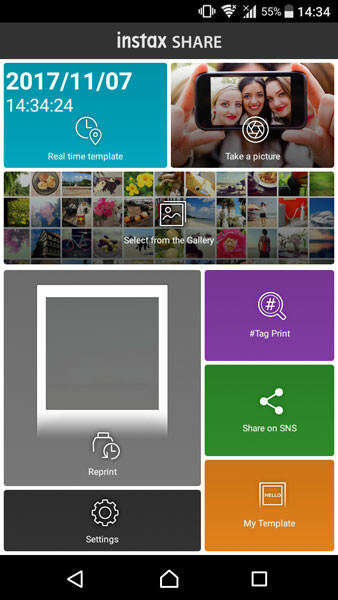 The app then allows you to take an image, search your phone gallery for one you'd like to print, or you can also connect to your Facebook and Instagram accounts through the app by logging into your page. When you select an image, you'll see a preview of what it will look like when printed. You then have the option to edit the image, add filters and manually adjust the contrast, saturation and brightness. This is great as it allows you to alter what part of the image is in the frame - most smartphones shoot rectangular images which can be awkward for translating into square format images. You can also rotate the image and zoom in. In filters, there are monochrome, black and white and smart filter options, which you can view on screen and confirm before they become final. The manual adjustments allow you to alter brightness, contrast and saturation of your image with sliders. There's also the option to add a template to your photo, allowing you to add wording and simple emojis although this does eat into the available image room, taking up more of the frame. It's ideal for remembering important dates. Once you're happy with your image, you can press the 'connect and print' button, which then searches for the printer. 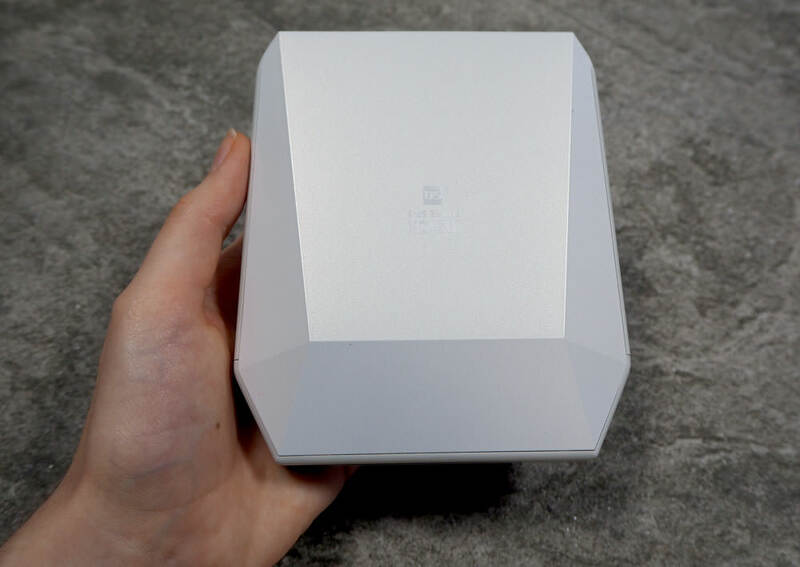 When it's turned on, you can connect to its Wi-Fi network through your phone, and it'll then ask you for a pin number (set to default at 1111 unless you want to change it for security reasons or to stop kids printing loads of images). Enter this, press ok, and the image will print. The app tells you how many prints you have left as well as the battery level of the printer. It's really easy to load the film cartridges, they simply slide in and you have to line up the yellow dots on the printer and the cartridge. Once the lid is clipped shut, it'll spit out the plastic protector, and then you're ready to go. Make sure you don't re-open the door until you've used up all the prints. Overall we were impressed with the photo quality although we did notice that if you use photos that have been zoomed in or altered in size, print quality wasn't as good. The Instax Share SP-3 is due to be released in the UK on 17 November 2017 at £174.99. This is relatively expensive when you take into account the cost of the films too. This is roughly the same price as the older models of the same camera. 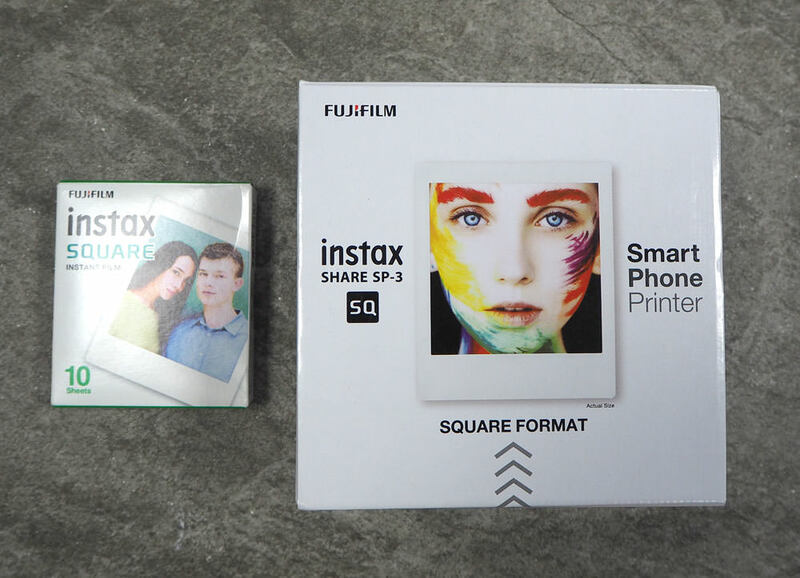 If the square format film isn't a must-have, the Instax Share SP-2 (£140) and Instax Share SP-1 (£139) which both print Instax Mini film - about the size of a credit card. Speaking of film, 20 shots of Instax Mini film can be purchased for £14.24, and 10 shots of Instax Square film, required for the SP-3 is available for £8.95. 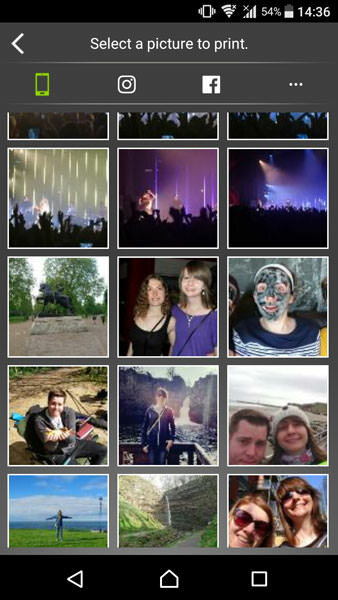 There are currently no other brands which print out photos from your phone onto instant Polaroid-style photos. 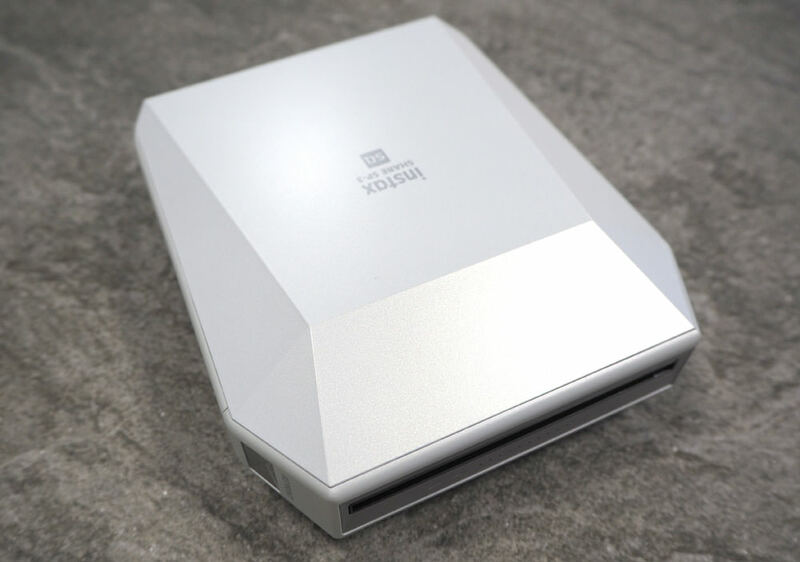 There are similar products, such as the HP Sprocket, available for £108.91 which prints 2x3 inch snapshots onto photo paper, and Polaroid ZIP Mobile Printer, available for £109.99 which also prints 2x3 inch photos onto ZINK paper. The Fujifilm Instax Share SP-3 is a great choice if you're a fan of the square format film and want to be able to create images from your smartphone that feel a little more robust than the small photo paper images created by rival brands. These printers are a great idea for smartphone shooters as they guarantee that you'll get a well-exposed image, something that can be a gamble when using an instant camera. The printer is relatively chunky however will easily fit into a rucksack or large handbag and doesn't weigh much. Alternatively, the beauty of the camera is that you can leave it home and print off your favourite snaps from the day when you get back. The price is relatively expensive however without much competition and the novelty aspect of the product, it's not outrageous. We are happy to recommend the printer as a great way to make your smartphone images tangible in an iconic format. The Instax Share SP-3 is a fun printer that's easy to use and allows you to give smartphone images a tangible format. but why on earth you should use that crap!!?? if you take (1000s of) pics with your cell/smart-phone - yu culd print them wireless at most printers/scanners and facilities in shopping malls / stores for way cheaper prices (in need of an analogue print, if you really would be in need - given that almost evrybody now is in social media where he/she can receive instantely a digital snapshot. But that's the beauty of this device - you can print your favourite photos taken with a smart device to have and to keep in an iconic format. If you don't want to print your smartphone images - fine, but if you want to share them with friends and family in a format that can be displayed this is a great way to do it. And they're more durable than the 2x3 inch prints you get from other instant printers. But that's the beauty of this device - you can print your favourite photos taken with a smart device to have and to keep in an iconic format. If you don't want to print your smartphone images - fine, but if you want to share them with friends and family in a format that can be displayed this is a great way to do it. And they're more durable than the 2x3 inch prints you get from other instant printers.